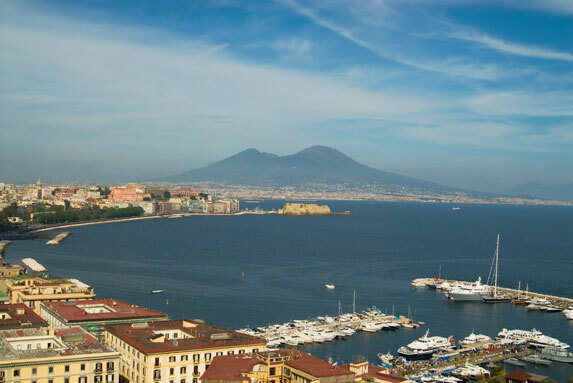 Naples is the homeport for the Sixth Fleet, and its Naval Support Activity (NSA) provides the administrative and logistic support to more than100 tenant commands and activities throughout the Mediterranean region, which includes personnel assigned to NATO and forces. Naples is also the headquarters of NATO AFSOUTH. Its military population includes 2,650 active duty personnel, 3,250 active duty family members, 750 DoD civilians, 925 NATO military and 925 NATO family members. The Navy population includes personnel from many diverse shore activities. The operational aspects of the mission are located at the Naples Airport in the Capodichino district, which also has a military passenger facility. Most of the support activities, including housing, are at Gricignano, 15 miles north of Capodichino. Also included in the Naples area military community are about 1,000 Navy people and their family members in Gaeta, a small coastal town 60 miles north of Naples, homeport for the flagship of COMSIXTHFLT. Carney Park, in a volcanic crater five miles north of Gricignano, has several baseball fields, a soccer field, an Olympic size swimming pool, campsites, cabins, picnic shelters and a small golf course. The NSA Capodichino has an indoor pool, outdoor beach volleyball court, Jacuzzi and a customized audio system for nine channels and video selections. The Education Centers at Naples and Gaeta sponsor the Universities of Maryland and Oklahoma, the City Colleges of Chicago and Central Texas College which offer classes to persons interested in pursuing an Associates, Bachelors, or Masters degree. There are DoDDS elementary schools at Gricignano and Gaeta, and a high school at Gricignano. The hospital at Gricignano provides general clinical and hospitalization services for all eligible beneficiaries. Specialty clinics offered include orthopedic, internal medicine, pediatrics, general surgery, neuropsychiatry, obstetrics and gynecology, ophthalmology and general practice. There is a Medical and Dental Clinic at Capodichino and a Branch Medical Care Clinic in Gaeta. FFSC, located in the Village Forum with the Navy Lodge, provides a wide range of information, education, and counseling services to single and married personnel. Complete Roman Catholic and Protestant programs are available at the chapel in Gricignano. Other worship opportunities include Living Word Gospel Fellowship, Liturgical Protestant Service, Contemporary Protestant Worship, Islamic and Jewish services. Sunday School and CCD programs are also offered. O'Rhys Irish Pub (also at Carney Park) serves a variety of dishes, from salads and sandwiches to steaks and seafood. It also has Happy Hour 4 to 7 weekdays and Karaoke Night Fridays. Noble Roman's Bar & Grill, at Gricignano and Capodichino, has a variety of foods and a dance party every Friday. The Navy Federal Credit Unions at Gricignano and Gaeta offer all the services of branches in the U.S. including withdrawals, deposits, and transfers, loans, mortgages, credit cards, and traveler's checks. There is also a Community Bank local banking center at Capodichino. Some 864 housing units at the Support Site in Gricignano provide many amenities of stateside living, with 110-volt electrical current, potable water, central heating and air conditioning, and full size appliances, including dishwashers. All E1-E6 service members accompanied by family members with an eligibility of two or three bedrooms will be directly assigned to government housing for the duration of their tour. Single E1-E4 service members will reside in the BEQ upon arrival. If space is not available, they will reside in the Navy Lodge until BEQ space is available. There is no government housing available in Gaeta. The Navy Lodge at Gricignano has 96 modern rooms with air conditioning, private baths, and fully furnished kitchenettes. Some suites and business class rooms are available. For its guests, the lodge also has a NEX mini-mart and laundry facilities. There is also a Navy Lodge at Gaeta. Comparable to a medium sized supermarket in the U.S., the commissary at Gricignano offers a diverse selection of American merchandise as well as a wide selection of fresh meat and produce. The Navy Exchange, also at Gricignano, stocks a selection of electronic and stereo equipment, CDs and cassette tapes, video tapes, housewares, cosmetics, toiletries, clothing and uniform items. There is an Exchange Mini-Mart at Capodichino, and the NEX and commissary are combined at Gaeta. MWR has extensive programs at Gricignano, Capodichino and Gaeta. Among other things it sponsors movie theaters, libraries, Auto Hobby Shops, ITT, swimming pools, and LIBERTY (Life Is Better Everywhere Recreation Takes You).